TAXI, a multi-disciplinary studio based out of Toronto, created an app and site known to Canadian drivers as Pothole Season. 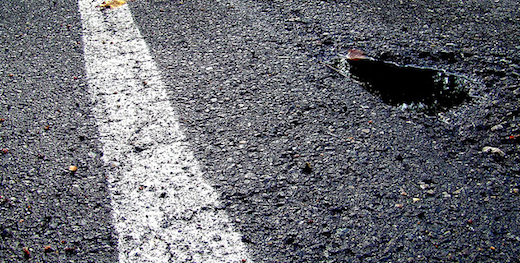 The app & site allows anyone to report potholes and get directions to places while them along the way. So far over 2,615 potholes have been reported using the app. But as well as the app is designed (trust me, it’s slick), the topic isn’t exactly thrilling. On top of that, whenever I hit a pothole, I prefer to swear, curse and then move on — instead of actually reporting problems to the city or other drivers. In Quebec, spring heralds the return of good weather, but also heralds the return of nest-holes. This phenomenon of the passage of the rigorous Canadian winters creates many difficulties for motorists. In order to simplify their lives, the agency Taxi has developed a digital tool available in the form of iPhone application and website for identifying all those holes in the asphalt. To further this commitment and encourage the use of these tools, the agency achieved a PR stunt in the center of the city of Montreal. The idea, simple but perfectly executed, is to stage a car so hyperbolic undergoing a nest-holes. Overall it’s an impressive take on a real problem for local drivers. Hopefully the stunt will help give the app some of the attention it deserves!